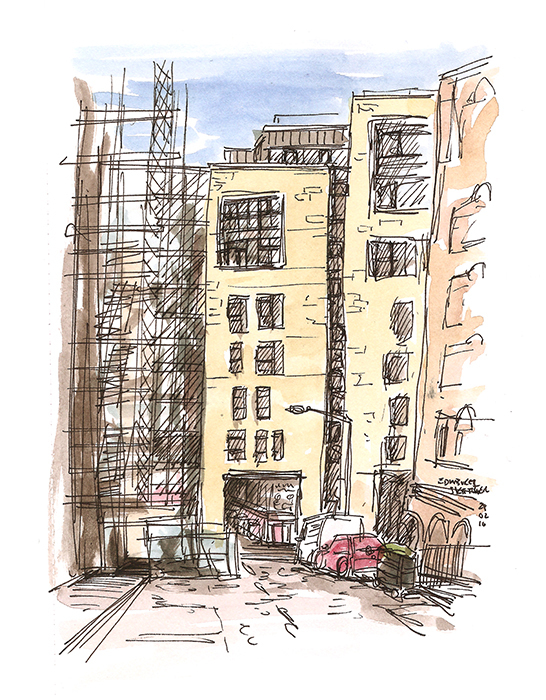 In the Cowgate today for a meeting and drew this sketch on Blair Street. The view was dramatically, and destructively changed in 2002 when a fire ripped through the Gilded Balloon Theatre. Burning for 4 days the fire destroyed eleven buildings and a significant part of the Cowgate. Now partly covered in scaffolding the view is a mixture of old and new, and a reminder of how precious, and vulnerable the historical buildings of Edinburgh are.